I was not sure about the meaning of such statement: the first ideas in my mind pointed me to think about some kind of pointer related syntax. I was induced to think so for the caret (^) and the at (@) symbols (operators? ), which allow dereferencing a pointer and returning the address of a variable respectively. So, if you are going to use it, make sure you append a small comment. This comment will allow further readers of your code to understand the syntax on the fly. RBC clients have to pay a monthly fee as a compensation for using (or holding) their debit card (client card). The amount varies depending on the plan you have chosen. In my case, I have to pay $4.00CAD each month. This allows me to perform up to 13 transactions. Other clients, with higher privileges, are allowed to execute more transactions and for that a higher fee is applied. If you want to avoid this Monthly Fee, I suggest you to open a Tax-Free Savings Account (TFSA). For that, go to your near branch of RBC and ask for a banker (account manager). Tell this banker you want to set-up a Tax Free Savings Account. There is no minimum deposit to open this account; in my case I just put 10 dollars, which is a good idea if you don’t want to put much money in this investment. By holding a TFSA you become an investor of the bank, which is why they refund you the $4.00CAD of your Monthly Fee. Notice a monthly fee of $4.00CAD applied on November 2nd (see red rectangle). Notice also on November 2nd, a deposit of $4.00CAD (see blue rectangle). The deposit, labeled MultiProduct Rebate, was made as a compensation for being an RBC investor; in other words, I was rewarded with $4.00CAD for having a Tax-Free Savings Account with RBC. It’s easy to figure out that the difference between the monthly fee and the MultiProduct Rebate is zero. This means, you will be saving 4 dollars each month…it’s like avoiding your Debit Card Monthly Fee. You will save $48CAD annually. Holding a Tax-Free Savings Account gives you more advantages, but I will talk about that in further posts. Feel free to ask any questions in the comments section, I will be glad to answer them if I can. The purpose of this post is NOT to cover the insights and applicability of the Singleton pattern, instead I just pretend to give you a Delphi code snipped that implements it. This implementation is focused in avoiding variables that are global to the unit (or Unit Global Variables). Fist of all, I am borrowing the definition and UML diagram of the Singleton Design Pattern, as written in the Design Patterns: Elements of Reusable Object-Oriented Software book. I strongly suggest you to read this book if you want to have a deeper understanding of the classic design patterns. All classes inherit from TObject ultimately. As TObject has its own constructor, the consumers of the TSingleton class can call it directly, allowing this way the creation of more than one instance. Ali, writer of the first comment in this article, pointed me in the right direction. Thanks Ali. I traduced Ali’s words into the source code above. The strikethrough text can be removed and the text in blue was added. This implementation ensures the singleness of the Singleton Design Pattern in Delphi. Yes, two point of access: TSingleton.Create and TSingleton.Instance. The only point of access to the singleton instance is the class function “Create”, which hides the TObject.Create parameterless constructor (more details here). Now we have only one instance and a global point of access to it. _instance: TSingleton; //Unit Global Variable. As a conclusion, I would suggest avoiding unit global variables as much as possible; in fact, as a rule of thumb, I would suggest to make your variables' scope as local as possible. This applies not only to this example (implementation of the Singleton Design Pattern), but to programming in general. Furthermore, the class variables in Delphi are equivalent to static member variables in C++, Java, C#...Class variables were introduced in Delphi 7; so, previous versions should use global variables to implement a Singleton class. A tag cloud  is a list of terms in which each item has a corresponding weight. The weight represents the importance or popularity of each term. Tag clouds usually have a visual representation, and the weight can be translated into a different font size, color, style, text orientation and others. Changing the appearance of each tag in the cloud allows the readers to perform a quick scan and detect the most ranked terms in the cloud. One final consideration is that tags are generally linked to some related content. This can be achieved for example, by means of a hypertext link (...a href=...) anchored to the affine content. i: is an index ranging from 1 to the total number of tags in the cloud. Si: is the display font size of tag i. You need to calculate Si for each tag in the cloud. Fmax: is the maximum font size value to display. This value is chosen by the user. Ti: is the number of occurrences of tag i.
Tmin: is the minimum of all Ti values. Tmax: is the maximum of all Ti values. For the list of tags above, the corresponding Ti values are: T1=9; T2=12; T3=7; T4=13; T5=10; T6=12; T7=15; T8=2; T9=16; T10=10; T11=5; T12=4; T13=10; T14=6; T15=10; T16=1; T17=11; T18=8; T19=10; T20=18. as S8 = 18% < 90%, then S8 = 90%. as S11 = 71% < 90%, then S11 = 90%. as S12 = 53% < 90%, then S12 = 90%. as S14 = 88% < 90%, then S14 = 90%. as S16 = 0% < 90%, then S16 = 90%. Notice that if you click on a tag it will search any related content withing my blog. Try it! A tag cloud is also referred as a word cloud or weighted list. In this context, tag is a synonym of term; sometimes even a synonym of word. Nevertheless, I don't like the latest assumption, because the practical experience shows that a tag can be formed using two words or more. You can chose whatever value you want for this parameter. However, depending on what you set, the appearance of the tags in the cloud might vary. Cubacel is the only mobile operator in Cuba and all cell phones in the Island are Pay As You Go phones. That means you need to buy some credit and add it to your account before you can use it. This process of adding credit to a cell phone account is known in Cuba as a recharge (recarga in Spanish). In English speaking countries the recharge is known by the term top-up. Don’t get confused: top-up and recharge are just the same thing. It basically means adding credit to the cellphone before you can use it. You can buy a top-up card in one of the Cubacel commercial offices within the island. Or you can top-up (recharge) a cellphone over the Internet using your credit card or Paypal. I live in Toronto, but I have family and friends in Cuba. I have been recharging (topping-up) my mom’s cellphone in Cuba for more than 6 years over the Internet. I have tried several online services providing top-ups (recharges) for Cuban cells and the best is Ding (formerly known as Ezetop). Ding is the Top-Up provider that I currently use; I have been doing so for years. I recommend this service if you need to top-up a Cuban cellphone. Follow this link go to Ding. An important distinction: there are two different types of recharges that you can do through Ding. The recharge covered in this article is the cell phone recharge; which adds credit to your account and enables you to make phone calls, send messages and access the email in Cuba. There is another recharge, called Nauta Internet recharge, which enables the people in Cuba to connect to public WIFI access points and access the Internet. To know more about the Nauta recharge click here. If you want to read this article in Spanish follow this link: ¿Cómo recargar los teléfonos celulares de Cuba por Internet? How to make economical phone calls to Cuba? What kind of mobile phones are used in Cuba? How to top-up (recharge) the Internet (Nauta) balance of a cellphone in Cuba? For reference, you can find below an old version of this article that I wrote several years back. It compares some Top-Up providers. If you need to recharge the cell phone of someone living in Cuba, I have found three web sites allowing to do this online. All of them are recognized by Cubacel as business partners. 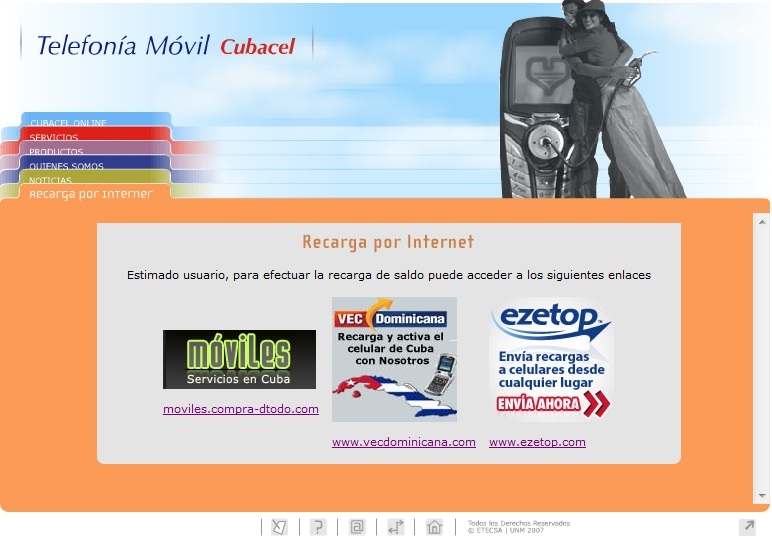 The picture below, showing such Web sites, was extracted from the official Cubacel's page. Compra D' TODO: This was the first site I tried. It works, BUT I didn't like it. First, they allow to choose the amount of $10CUC or $20CUC per recharge, but if you select $10CUC, a message dialog is prompted saying that the only available amount is $20CUC. This is ludicrous! Anyhow, I selected $20CUC and proceeded to pay with my VISA card. Secondly, these guys ask too many questions, they asked all my life during the registration process (yes, you need to register)...furthermore, the recipient of the recharge in Cuba is also interrogated (by phone call) before the recharge can be made active. So, this is in no way automatic, and it causes delays of hours. Finally, I don't recommend Vecdominicana. I didn't use it, but their fees per recharge are too high. To give you an idea, I payed $24.44CAD for the recharge of $20CUC in Compra D' TODO and $13.25CAD for a $10.95CUC recharge with Ezetop. Now, Vecdominicana charges you $16USD for a $10CUC cell credit. Too high, isn't it? 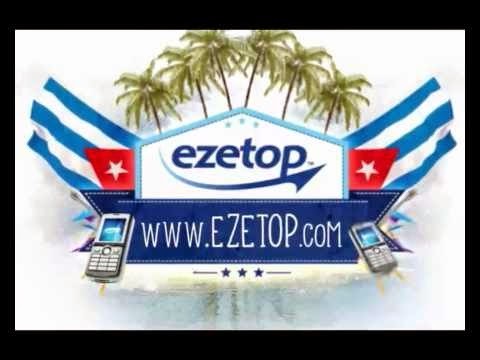 As conclusion, I recommend you to use Ezetop to recharge cell phones in Cuba via Internet. It works fine and fast, the cost is affordable and there are no annoying questions. When I first wrote this post I ended the article in this very spot. Nonetheless, I have added the Ezetop widget just below, from which you can recharge your friends and family in Cuba just now. Why am I doing this? Well, Ezetop will give me 4% of commission for every recharge ever done from within my blog (Hey, for you is just the same money: you pay the same money from here and from the Ezetop website). Please, note that I’m a fair guy. I wouldn’t recommend something if I weren’t truly sure that‘s the best choice. Trust me once and try Ezetop. If I disappoint you, then feel free not to use Ezetop again. The following video shows you how you to recharge a mobile phone with Ezetop . See how easy it is. : Cubacel is the ETECSA's Mobile Business Unit. ETECSA is the Cuban government monopoly of telephony services. : CUC stands for Cuban Convertible Peso. This currency is stronger than the American Dollar. Don't believe it? (LOL). And also it is NOT the currency in which the Cuban people is paid by its government. Yes, in Cuba, there is a dual currency model. : The layout of this site is very similar to the Cuban Government Sites (that's why so many question I guess). The language used is Spanish and you can use only VISA and MasterCard to pay. : This site is in English. You can pay using VISA, MasterCard or PayPal. In the very beginning, this blog was published on blogspot.com. The original Blog*Spot Address was something like this: subdomain.blogspot.com. At some point, I decided to publish this blog on my own domain and so I registered www.yanniel.info at Dynadot. Log into your Dynadot account using your username and password. Click the DOMAINS tab in the main menu. The main menu looks like this: SUMMARY | DOMAINS | SEARCH | WEB HOSTING | SSL | MY INFO| MESSAGES| MARKET PLACES| FORUMS. Mark the checkbox next to your domain name (in my case yanniel.info) and then click the "Set Name Servers" button in the the "Domain settings" section. In the new page, make sure you are located in the DNS tab menu. The menu looks like this: NAME SERVERS | PARKING | FORWARDING | STEALTH FORWARDING | DYNADOT HOSTING | DNS | FREE HOSTING | EMAIL FORWARDING. In the "Domain Record" section: select "Forward" in the "Record Type" combobox and write http://www.yourdomainname.ext (in my case http://www.yanniel.info) as your "IP Address or Target Host". In the "Subdomain Records" section: write www as your first "subdomain"; select "CNAME" in the "Record Type" combobox and write ghs.google.com as your first "IP Address or Target Host". This CNAME record value (ghs.google.com) is particular to Blogger...so, if your are NOT using Blogger your should use the corresponding CNAME record. Finally, click "Use Dynadot DNS" button. After your Dynadot settings are set, expect a delay of one to three days, before all the DNS servers have been updated. I suggest that you wait this time before proceeding to configure the Blogger settings. Tell blogger to use your custom domain. For that go to: Dashboard-> Settings -> Publishing ---> Custom domain ---> Switch to advanced settings. Enter "Your Domain" name (in my case www.yanniel.info) and the captcha "Word Verification". Finally, click the "Save Settings" button. For a more general guideline to configure a custom domain in Blogger refer to How do I use a custom domain name on my blog? Going back in time a little bit, I noticed that I also had a SERVICE FEE – 4EPMT/WD/TFR@$1.50 on August 2nd, 2010. At that time I was charged with $6.00 (CAD). They apply always on the second day of every month. The amount of the fee is the result of multiplying $1.50 by the number preceding “EPMT” in the description. At this point I decided to go to the nearest branch of the RBC and ask about the reason for those fees. They said I was charged because I had withdrawn money from my “savings account”, which is intended for “saving” and not for “making payments”. So, if you plan to pay for anything, don't use directly your “savings account”, instead use your “checking account”. How to open a checking account at Tangerine? Note: I am a client of Tangerine. These guys conduct a very clear business. They don’t trick, they don’t hide stuff and above all, they don’t charge any fees. Please, if this article was helpful, then share it by clicking the Google Plus (G+) button at the beginning of this post. Savings accounts are intended to save... or so RBC  says. There's one golden rule: the money that goes into the savings account should stay there. If you don't follow this norm, you will be charged $1.50 per each transaction you make directly from your savings account.These charges are named service fees. Service fees apply in most situations that you have moved money out from your savings account. For example, whether you withdraw money in an ATM machine, pay with your debit card or make any kind of transaction using your savings account, you are busted and then you should pay the corresponding service fee. If you need to use the money in your savings account, first, transfer that money to your checking account by means of the RBC online banking. Then use your checking account to make the payments or withdraw the amount you need. Even this way you might be charged, because sometimes transferring from savings to checking is penalized with $1.50 per transaction. This depends on the type of savings account your are using. My advice: use RBC High Interest eSavings™ account, which gives you higher savings interests and also allows you to transfer money from savings to checking without being charged. A better advice, do you banking with an institution that is not waiting for you to make a “mistake” in order to fine you for it. So far, my best candidate is Tangerine. I outlined some of the benefits of banking with Tangerine and how to open a checking account at this institution in almost no time and from the comfort of your home. The details can be found here: How to open a checking account at Tangerine?. 1.) Login into your online banking account. 2.) Expand your savings account details by clicking on the corresponding link. 3.) Click Personal Accounts --> Change Account Type or Add Owners in the left column of the page. : RBC stands for Royal Bank of Canada. : Important: The money being moved (transferred) is extent of charge only if you use online banking. This topic has been covered many times on the Internet, but bloggers don't to pay much attention to it. So, in this article, I am bringing some light to this matter (AGAIN), even if my post is labeled by Google as “duplicate content”. Blog Home Page Title: corresponds to your blog title. For example: the home page title of this blog is “Yanniel's notes”. Post Page Title: is formed by concatenating your blog title, a colon-space (“: ”) and your current post title. For example: the page title for this post would have been by default “Yanniel's notes: A SEO advice for Blogger: Remove the blog title from the post title”. The pattern followed in point number 2 is really bad from the SEO point of view. The page title is one of the most (if not the most) important aspects for Search Engine Optimization; which is why, replicating the blog title on each post title is not wise. That behavior leads Google, Yahoo, Bing and other major search engines to depreciate your post entries, because they find “duplicate content” in all the titles of your blog pages. I really don't see any benefit in prefixing each post title with the blog title. Open your Blog Template HTML editor, available thought Menu->Template -> Edit HTML. Click the Save Template button. Done! Notice that my post title is no longer: “Yanniel's notes: A SEO advice for Blogger: Remove the blog title from the post title". The strikethrough part was removed! I was in the subway two days ago and suddenly I heard one person saying to another: "la luz de alante es la que alumbra" . As the only people in the word using such a phrase are Cubans, I interrupted the lady that was chatting with a rhetoric question: Are you Cuban? Leticia looked at me with a familiar smile and answered affirmatively. Shortly after, I was introduced to Mario, a fine Argentine man, which surprised me due to his deep understanding of the Cuban culture . After a quick catch-up with Leticia , Mario gave me his card and explained to me that both of them work for Mennonite New Life Centre of Toronto (MNLCT). MNLCT is a non-profit organization that helps and guides immigrants and political refugees in the Toronto area. Although there are other well-known organizations like YMCA, MNLCT differs in the fact that it not only assists "legal Canadian residents": Suppose you are a Cuban escaping from Cuba, where would you go without money and without papers? Well, I suggest you give MNLCT a try. At the very least, they will point you in the right direction for FREE. One final quotation: MNLCT welcomes newcomers, immigrants and political refugees from all nationalities, not only Cuban guys. : A similar idiom in English would be: "a bird in hand is worth more than two in the bush". : It is worth mentioning that Mario Bianchi was closely involve with the relocation (in Canada) of 17 Cuban political prisoners, released after the visit of the Venerable Pope John Paul II to Cuba in 1998. I decided to move away from Blogger's free hosting service and get me a custom domain. Although you can register a domain from within Blogger, I decided to use a different domain name registrar: Dynadot. 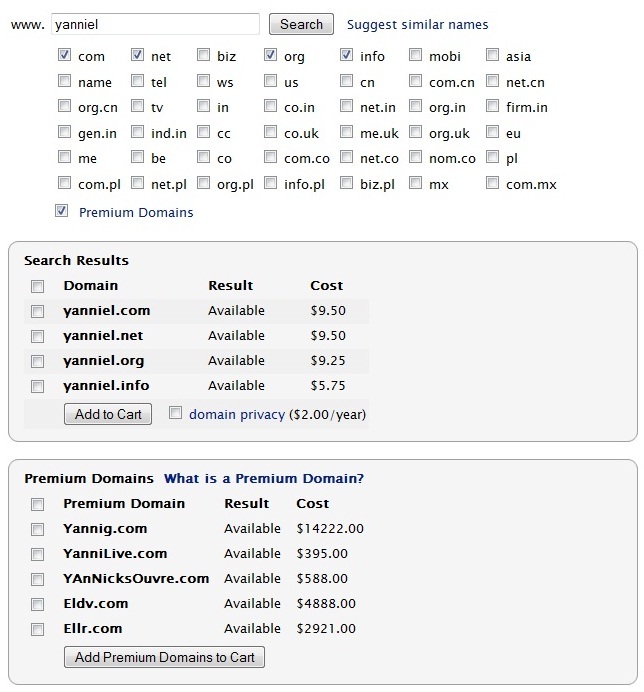 Domain search (extended to premium domain search if desired). I wanted a generic domain name for my blog (not a .cu, .ca, .us domain). So, my initial ideas were yanniel.net, yanniel.com, yanniel.org and yanniel.info. After a quick search, I decided to buy yanniel.info because it was cheaper and at the end, this blog is all about me. So, yanniel.info (standing for Yanniel's information) is pretty much what I wanted. 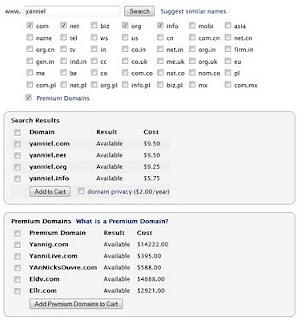 One observation, the domains bought at Dynadot are cheaper than the ones you buy directly from within Blogger. Blogger charges you with $10 (USD) annually, and a I got my domain just for $5.75 (USD). Once you have added your domains to cart, you are prompted to log-in (or register) as a Dynadot's user. This is indispensable to configure your domains later. I expect to replace my current blogspot.com sub-domain with www.yanniel.info ASAP. I guess at that point I will write a new post to explain how to set up a Blogger 's blog using a Dynadot registered domain. You can do that by hand of course, but you can also use macros to streamline your work, specially if you need to convert more than just a few lines of code. Macros allow to record a sequence of keystrokes and playback such compilation with just one saved keystroke. Use as many keystrokes as you want to transform your code. In the previous example I recorded (and played) a macro containing 20 steps (keystrokes), but I am sure you can do the same with less keystrokes. If you do, please, write you keystrokes in the comments section at the bottom of this post. : The unit containing the full source code of this example is at the end of this post. Recently, Rogers Communications Inc. implemented a mechanism (known as BitTorrent throttling -blocking-) to prevent the download of BitTorrent files from within its network. I guess they are trying to block illegal copyrighted downloads; but the fact is, BitTorrent is not an illegal technology, and it is used to share fully licensed materials as well. If they were a fair company, they would allow their customers to cancel the contracts; nevertheless, they have put ridiculously high cancellation fees in order to prevent their clients from freely changing to a better ISP option. Install Vidalia in your computer. “Vidalia is a cross-platform controller GUI for the Tor software”. You need to install the appropriate Vidalia's distribution, depending on your current Operating System (Windows, Linux, Mac). Specify the following proxy setting in your preferred BitTorrent client (uTorrent, Azureus, Vuze, Free Download Manager): Proxy address: localhost; Proxy port: 8118. Take a look at the following video. I have recorded how to download and install Vidalia in Windows. Furthermore, I have shown how to configure Free Download Manager (this is my preferred BitTorrent client) in order to access the Internet through Tor. You can see how the Torrent file gets downloaded. Please, notice this is a general guideline. It might require slightly variations depending on your OS and BitTorrent client. If you have any questions, write them in the comments section below, and I will do my best to answer ASAP. That's it! You can now download torrents from within the Rogers network with no restrictions. Warning: BitTorrent downloading over Tor does not warrantee your anonymity. In other words, you could be busted if you download copyrighted materials. Again, if your purpose is to go undetected when downloading Torrents, then Tor is NOT for you (read the facts). Don’t waste your time with this post anymore: my ONLY purpose here is to teach you how to mock your ISP BitTorrent blocking (throttling).